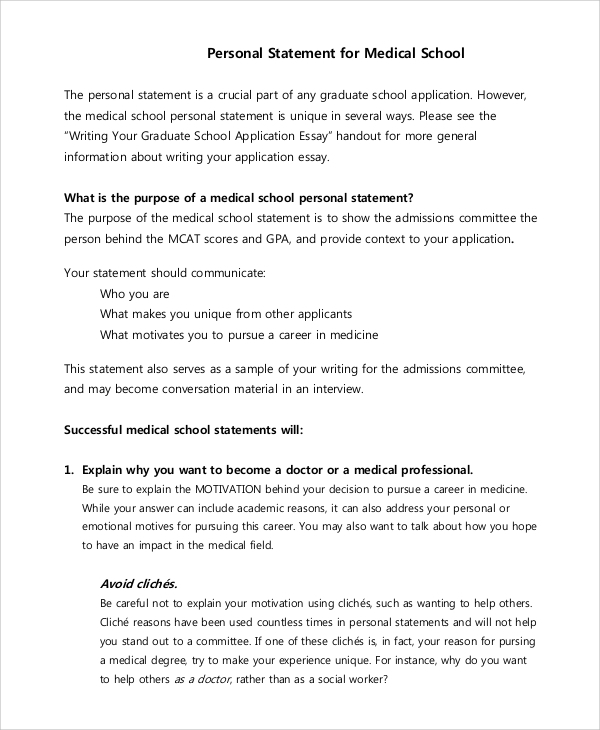 If you are a medical student and seek admission in a reputed medical school, you will require a Personal Statement Medical School to justify why you are fit for the institution. It is a comprehensive essay that conveys your message to the higher authorities, regarding why you are eligible for admission there. You need to put forward your attributes in a sophisticated format to win the confidence of the authorities. Here are some Sample Statements that you will find beneficial. This document consists of three parts, the introduction body, and conclusion. In the first part, you need to introduce yourself as an applicant, in the middle portion discuss what makes you fit for the position and end up with a positive and promising note. 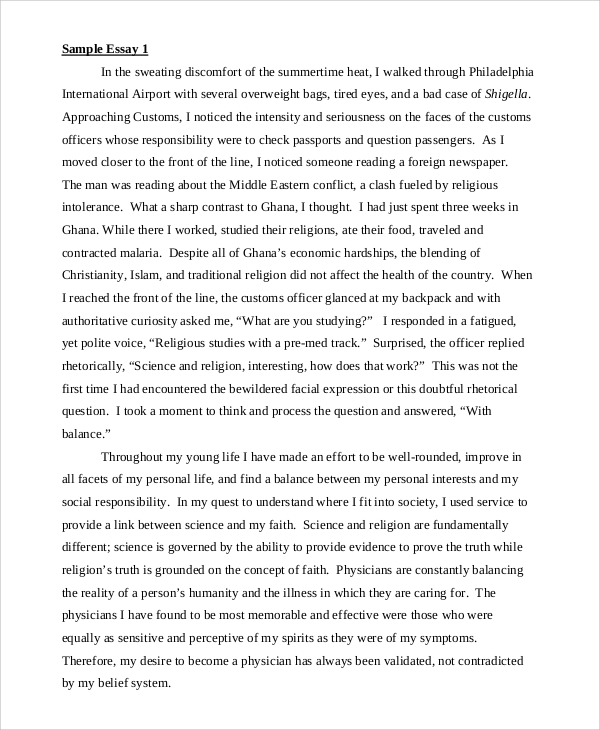 This essay is written in a descriptive format with a catchy introduction. 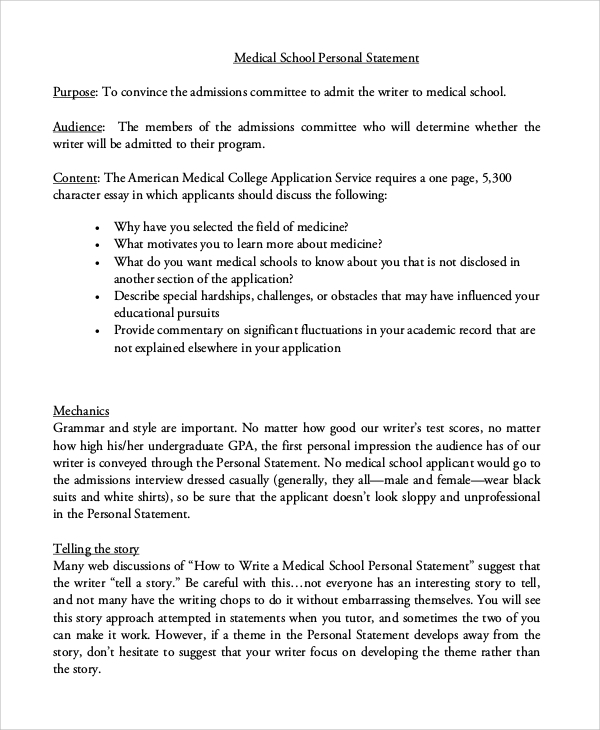 The Sample Medical School Personal Statements can include certain stories and incidents in the essay, and the language needs to be cultured to make a mark. To retain the attention of the reader until the end, you can start off the write-up with an interesting incident. Gradually, you can expose your attributes and traits. How to make the Document Effective? It is recommended that you should go through the Sample Personal Statements as much as possible. Focus on your uniqueness and explain why you are fit for the position. However, controversial topics should be better avoided in the statement and restrict your creativity to a certain level. In other words, you have to brew up your potentials and justify what makes you the right candidate to find a berth in the institution. 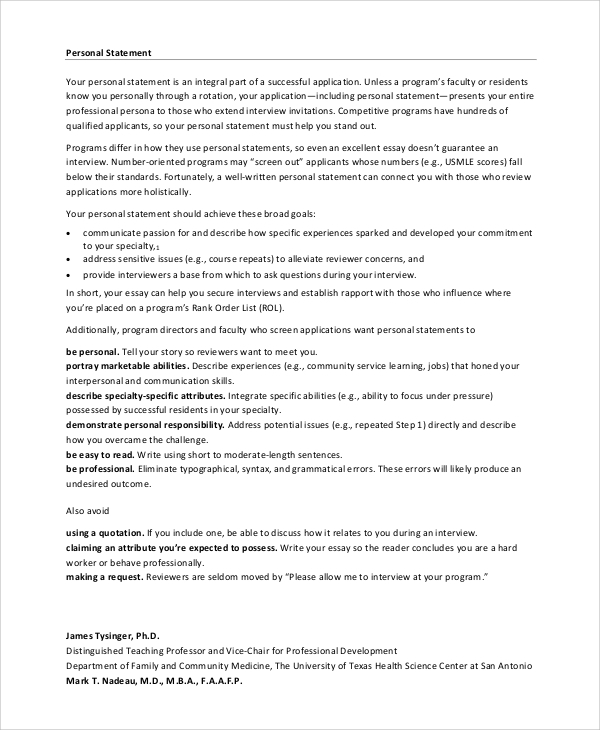 You can include your personal traits that are relevant to the institution. Apart from this, you can also mention the internships that you have done in the document if any. This will enhance your chances of getting selected. In this statement, the personal viewpoints of the students are included. You can mention why you went to a particular branch of medicine or the perspectives that you hold on the future of your career. You need to include the characteristics that make you different from the others. In this statement, you can include your soft skills. Share your personal detail, experience, motivation and make the document refined with an attractive tone and language. 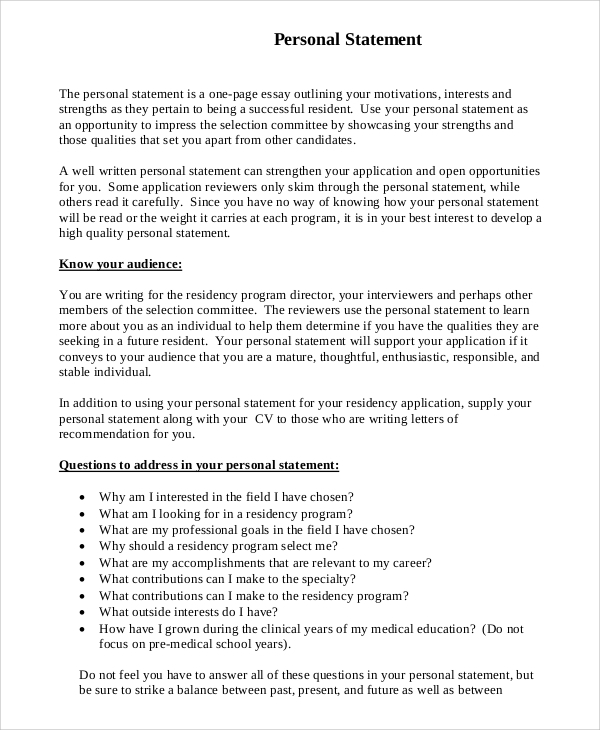 Why is a Personal Statement Important for a Medical Student? It is important to include a personal statement with the admission application, as it helps the selectors to assess your abilities. 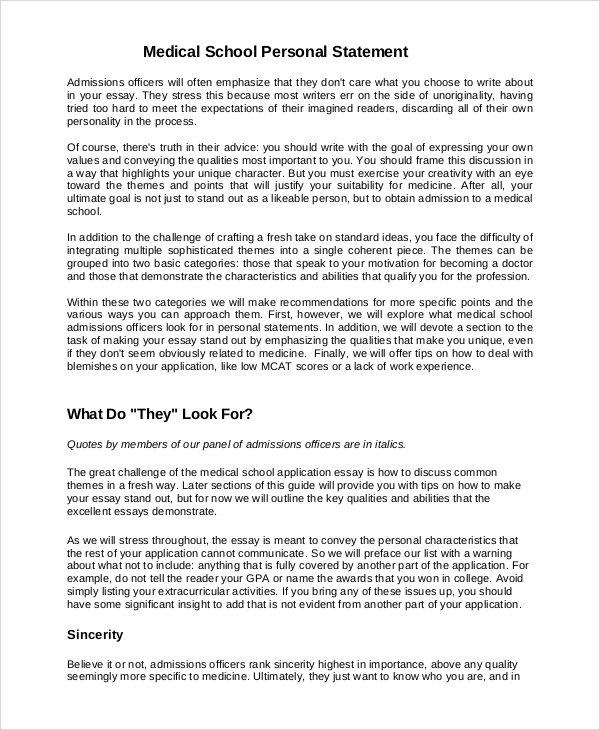 An admission form is a mere collection of information regarding your academic records. It cannot provide any insight into you as an individual, which is so crucial for them. A personal statement focuses on your attributes and personality. 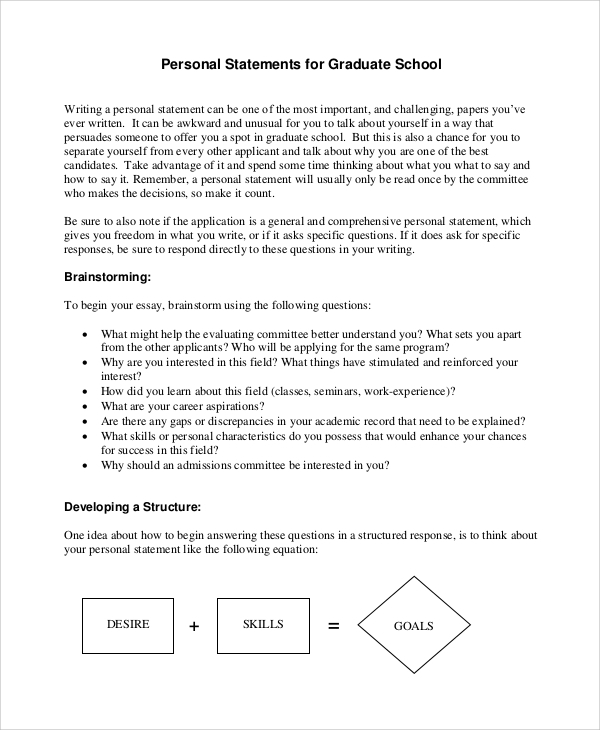 You can also see the Sample Law School Personal Statements. When competition is high in the academic sector, students need these documents to consolidate their positions in the institutions. It boosts up your chances of getting picked up, especially, when there is no much difference academically. This makes the personal statement essential for every medical student. To ensure that you follow the right format for the personal statement, you can browse the website and find the Personal Statement Format that you are comfortable with. Apart from this, you can get samples of Income Statement and Profit Loss Statements in the portal. Customize the documents as and when you require.